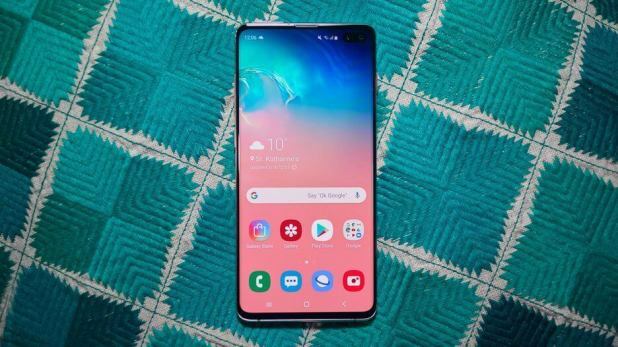 The Samsung galaxy S10 is flagship phone of 2019 so far from Samsung and as it turns out its actually three phones. 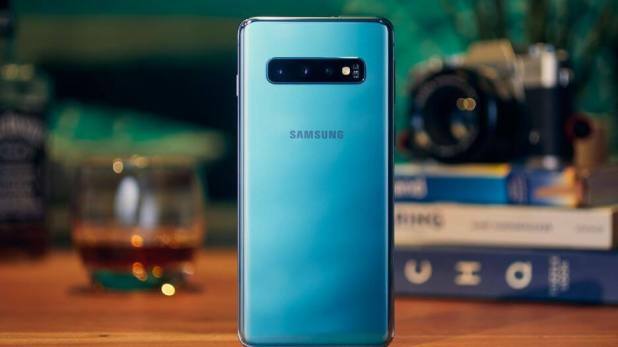 There is the Samsung Galaxy S10, the galaxy S10 plus and the galaxy s10e so three new phones each of them familiar in many ways as a Samsung phone but each of them also have their differences so first off here we going to focus on the two main ones, that is, the flagships the Samsung galaxy s10 and the galaxy s10 plus. You can bet they do look pretty good I mean no one ever thought Samsung phones were ugly at all but these look quite nice we kind of saw this coming from the renders so first off the new stuff for the galaxy s10. There are three main improvements and then a lot of small ones but the main ones are the display, the fingerprint sensor and the cameras. So the new display it’s simple, it’s got a 6.1-inch display for the s10 and a 6.4-inch display in the s10 plus and they continue the tradition of Samsung having literally the best displays in any phone for a couple of years running now and it continues to get even better. That means, you have a 90 plus per cent screen to body ratio now and it’s still a super-high resolution with a 19 by 9 tall aspect ratio but it’s now also HDR 10 plus certified and they’ve changed the name a little bit they’re calling it a next-level infinity display but still it goes right up to the very edges. You have the camera cutout right in the top right corner as we’ve seen in all the leaks, it is a laser-cut hole in the AMOLED panel to precisely cut this hole for just the camera to come through and nothing else and it’s a single 10 megapixel selfie camera for the galaxy s10 plus, it also comes with an additional depth sensor next to it for the dual cutout in the S10 plus, sadly, so no ultra wide selfie camera. It seems like Samsung’s cutout is maybe a little, just a little bit smaller than honors. It’s not too distracting it pushes the battery and the signal indicators over from the right edge. Samsung cleverly included a bunch of wallpapers that are slightly dark in the top right hand corner to make the whole bunch less jarring and they also draw some fancy animation around the cut-out when you switch to the front-facing camera so I guess they’re kind of embracing it so there it is, Samsung can now say they’ve technically never done a notch. 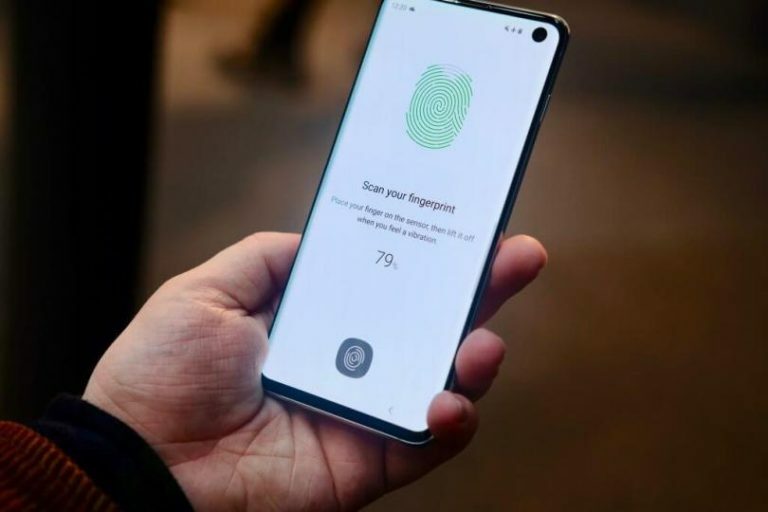 The number two main new thing is the new fingerprint sensor, Galaxy S10 has officially moved to the ultrasonic under the glass fingerprint reader which is pretty dope so you see the word ultrasonic in there and that’s not just a name they’re just making up. It’s actually means something as far as the technologies use for you and me. Although we’ve had under the glass fingerprint sensors in phones before namely in phones like the Oneplus 6t, they’ve mostly been optical fingerprint sensors shining a light on your finger to actually read your fingerprint. This Samsung galaxy S10 ultrasonic ones don’t use that so they have a couple of vintages. 3) It can read the fingerprints before waking up the display at all that is a pretty sweet feature. number three the third main new feature with galaxy s10 which is the cameras. So galaxy s10 now has the triple cameras on the back which mean Samsung is finally doing the three different focal lengths i.e one main camera, one telephoto and one super wide which is slick we have been waiting for that and hope Apple gets on this train next. But the new cameras on the back are already welcome, the main camera is a 12-megapixel sensor, dual aperture F/1.5 or 2.4 with OIS then the telephoto is also f/2.4 and has OIS and the ultrawide it doesn’t have OIS but you hardly need it at 123 degrees anyway and it opens up to F/2.2. We hope everyone adopts some sort of ultra wide camera. You can sort of seamlessly zoom between the cameras and it’ll switch automatically which camera you ran depending on how far you zoomed in it also keeps the intelligent camera with the improved scene recognition and all that honestly it’s looking like a winning package in the camera Department.